Women 100M Race may not generate the same interest that Usain Bolt or Ben Johnson generated, yet it is one important event in the field athletics. The Bolt in women Sprint could well have been Shelly-Ann Fraser-Pryce, a Jamaican track and field sprinter. Born in Kingston, Jamaica, Fraser-Pryce ascended to prominence in the 2008 Olympic Games when at 21 years old, the relatively unknown athlete became the first Caribbean woman to win 100 m gold at the Olympics. In 2012, she successfully defended her 100m title, becoming the third woman to win two consecutive 100m events at the Olympics. No woman in history can boast of as many global 100m titles.It was also her sixth World Championship gold medal. At Rio, the Jamaican, sporting an unusual look of green hair with five yellow sunflowers on the fringe, was hyped to win but faltered. It was Elaine Thompson of Jamaica who won gold in 100M sprint with 10.71 seconds finish (under 10 has never been run by any women anywhere ! ); Tori Bowie of US 10.83 and Shelly-Ann Fraser-Pryce of Jamaica coming third at 10.86 seconds. If you are following them ~ at IAAF, London2017 - USA's Tori Bowie stormed to World Championships 100m gold from Marie-Josee Ta Lou and DafneSchippers as Olympic champion Elaine Thompson was left empty-handed. A night after American Justin Gatlin shocked Usain Bolt in the men's final, Bowie went one better than a year ago in Rio as her perfect dip on the line nicked the race from Ta Lou by one-hundredth of a second. 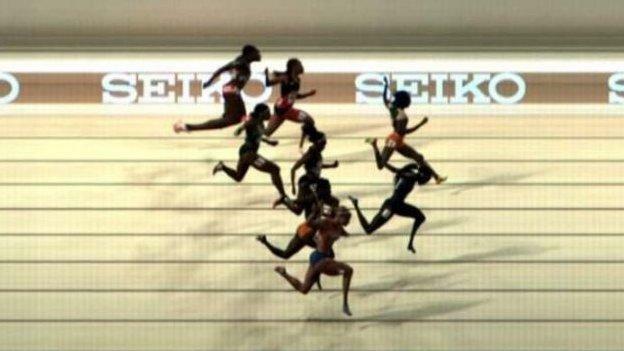 Jamaican favourite Thompson, who had looked peerless in winning her semi-final earlier in the evening, had a start even worse than Bolt's and appeared to lose her stride twice as she faded into fifth. Ivory Coast's Ta Lou initially thought she had it won, but her personal best of 10.86 was good enough only for silver, the Netherlands' Schippers coming through for bronze in 10.96. Having won gold in both the 100m and 200m in Rio, Thompson came to London Stadium as the fastest woman in the world in 2017. Her defeat is thus arguably even a bigger shock than Bolt's, capping a hugely disappointing two days for Jamaica, the dominant force in sprinting over the past nine years. The photo finish illustrates how close Bowie and Ta Lou were as they crossed the line ! Bolt's race had been lost with his reaction time from the blocks of 0.183 seconds, the slowest in the field. And Thompson made exactly the same mistake, getting out in a horrible 0.2 seconds, and she would never recover. Analysts say that if only she had lent into the line the title would have been hers. 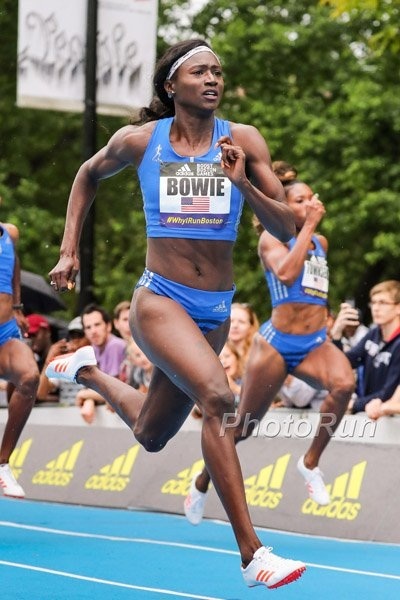 But Bowie, coming through late on the outside just as Gatlin had 24 hours, threw herself into the final few metres, and while the effort sent her tumbling to the track it proved critical. Thompson does not even have the consolation of the 200m to aim for, her bemusement afterwards shared by the thousands of Jamaican supporters in the stadium who had come expecting a measure of payback for Bolt's great disappointment.